Vancouver, BC - Skyharbour Resources Ltd. (TSX-V: SYH) (OTC Grey: SYHBF) (Frankfurt: SC1N) (the “Company”) is pleased to announce it has successfully identified basement conductor targets in a setting proximal to other high-grade discoveries in the area at its 60% owned Mann Lake Uranium Project (the “Property”). The Company recently completed its Phase 1 Field Program consisting of a ground-based electromagnetic (EM) survey on the property which is strategically located on the east side of the Athabasca Basin 25 km southwest of Cameco Corp’s McArthur River Mine and 15 km northeast and along strike of Cameco's Millennium uranium deposit. Skyharbour’s Mann Lake property is also adjacent to the Mann Lake Joint Venture operated by Cameco (52.5%) with partners Denison Mines (30%) and AREVA (17.5%). Recently, Denison acquired International Enexco and its 30% interest in the Mann Lake Joint Venture after the 2014 winter drill program discovered high-grade, basement-hosted uranium mineralization. The drill program intersected 2.31% eU3O8 over 5.1 metres including 10.92% eU3O8 over 0.4 metres (see International Enexco News Release dated March 10th 2014). EMpulse Geophysics of Dalmeny, Saskatchewan conducted the ground EM survey and Phil Robertshaw (P.Geo., Saskatchewan) reviewed the collected data and provided an interpretation of the survey. The natural source transient magnetotelluric survey consisted of a block of 4 profiles totaling 10 km of coverage using the Internal Field Gradient (“IFG”) technique. The survey focused on a zone in the southern portion of the Mann Lake property where a favourable, 2 km long aeromagnetic low coincides with possible basement conductor trends indicated by prior ground EM surveys. The survey was successful in confirming the presence of a broad, NE-SW trending corridor of conductive basement rocks which are probably graphitic metapelites. 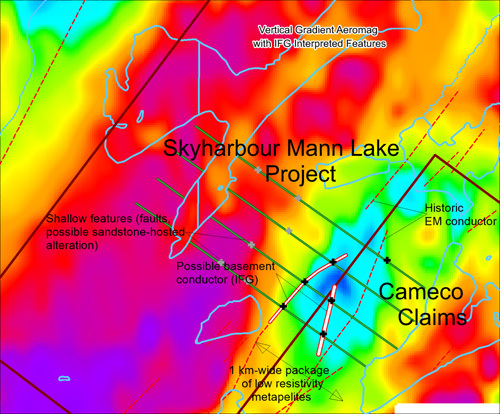 The corridor appears to be about 1 km in width, straddling the border between Skyharbour's Mann Lake property and Cameco's adjacent claims, and is inferred to become more strongly conductive towards the southwest. Within the conductive corridor, IFG Gradient and Bearing Difference anomalies possibly indicate two or more graphitic conductor trends, of which one falls within Skyharbour’s Mann Lake property. In view of the favourable aeromagnetic setting of the conductive corridor, additional geophysical coverage including gravity and TEM is recommended. The Mann Lake Uranium Project consists of one mineral claim covering 3,473 hectares located in the eastern Athabasca Basin in northern Saskatchewan. The property is under a joint venture agreement with Aben Resources (TSX-V: ABN) owning 40% and Skyharbour owning the other 60% interest in the property. It occurs within a structural/conductor corridor that contains the richest uranium deposits in the world including Cameco’s McArthur River Mine. Skyharbour’s Mann Lake Uranium Project has seen over $3 million of previous exploration expenditures including geophysics and two diamond drill programs totaling 5,400 metres carried out by Triex Minerals in 2006 and 2008. The geophysical surveys identified basement conductors and structural corridors containing reactivated basement faults. These features trend onto the adjacent ground held by Cameco. The 2006 drill program intersected a 4.5 metre wide zone of anomalous boron (up to 1,758 ppm) in the sandstone immediately above the unconformity in hole MN06-005. Boron enrichment is common at the McArthur River uranium mine, and along with illite and chlorite alteration, is a key pathfinder element for uranium deposits in the Basin. In the same drill hole, an altered basement gneissic rock with abundant clay, chlorite, hematite and calc-silicate minerals was intersected about 7.6 metres below the unconformity, and contained anomalous uranium up to 73.6 ppm over a 1.5 metre interval. Background uranium values are commonly between 1 and 5 ppm. Skyharbour’s Mann Lake Uranium Project contains highly prospective geology and geochemistry, and a robust discovery potential as identified by the historic work. Additional field work and exploration has been recommended on a number of untested targets on the property. Skyharbour Resources Ltd. is a uranium exploration company and the operator of the Western Athabasca Syndicate which controls a large, geologically prospective land package consisting of five properties (287,130 hectares) in the Athabasca Basin of Saskatchewan. Approx. $3,750,000 of the planned $6,000,000 in combined exploration expenditures over a two year period has been invested in the properties thus far, the bulk of which is being funded by the three partner companies. 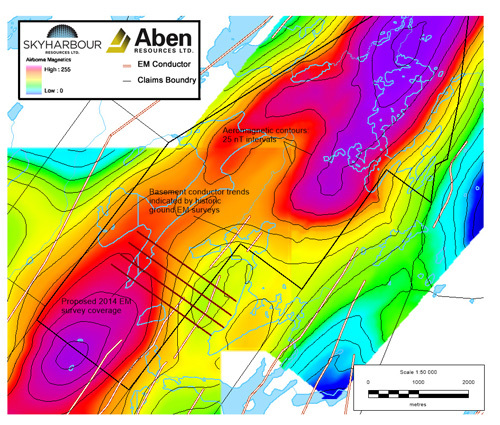 Skyharbour also owns a 100% interest in the Way Lake Uranium project on the east side of the Basin which hosts an NI 43-101 compliant inferred resource totaling 7.0 million pounds of U3O8 at 0.03% and 5.3 million pounds of ThO2 at 0.023%. 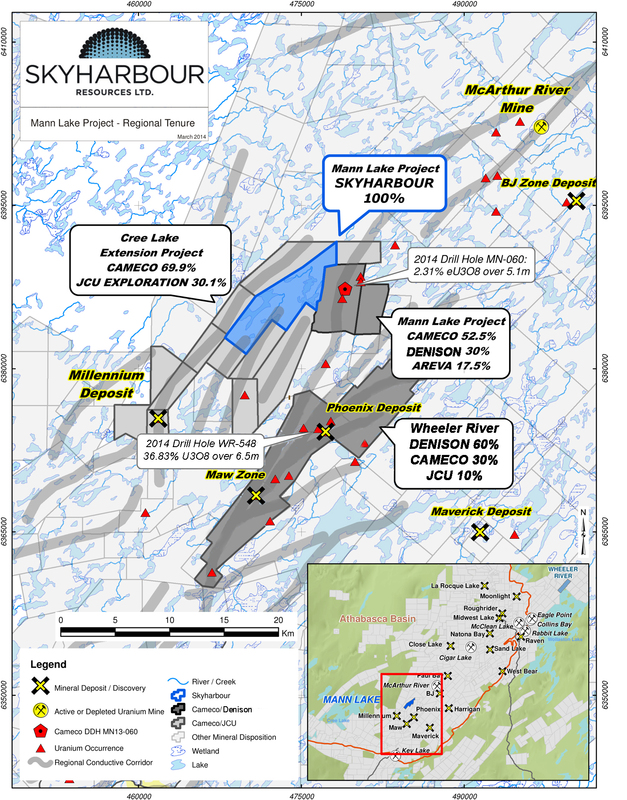 Skyharbour owns a 60% interest in the Mann Lake Uranium project on the east side of the Basin strategically located 25 km southwest of Cameco’s McArthur River Mine. The Company has 57 million shares outstanding with insiders owning over 20% of the outstanding shares. Skyharbour’s goal is to maximize shareholder value through new mineral discoveries, committed long-term partnerships, and the advancement of exploration projects in geopolitically favourable jurisdictions.